Feather is perfect (to my eye anyway) over this jump. 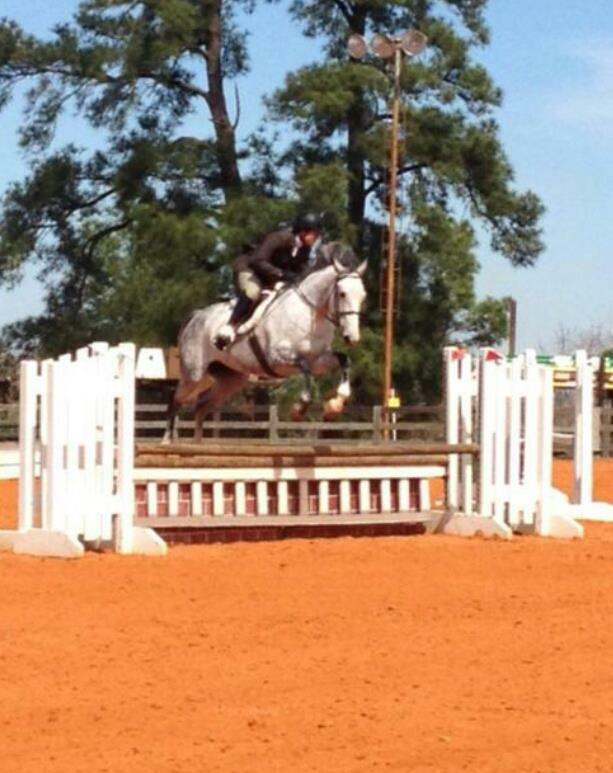 We had the first horse show of the year at Pine Hill-which is known for its Eventing venue. Many of Feather’s Flagmount relatives have soared over the cross-country courses and jumped well in the rings. We were here to do the hunters-which is judged on style, conformation and correctness. It is subjective, the judge picks who they like best according to class criteria. Lauren has been in the jumper ring (speed wins!) for several seasons now except for Feather’s two shows last fall so it was a big change for us. We got there Friday with Kona in tow, and Feather was pretty quiet. By arriving on Friday we had a day to school her in the ring and let her settle in before actually “showing” on Saturday. We had never taken her to any outside ring to show in and this would be a test of sorts, to see how well she could handle the stress and strain of new people, places and issues. She settled in well. Lauren was jumping a little defensively-waiting for the hot mare to jump out from under her. At one point, Dev told Lauren, you are doing five things and they are all wrong! Once Lauren relaxed and trusted Feather everything was fine. The hot mare never showed up, just a quiet, easy to ride mature mare. Schooling was over-the show would start Saturday. Back in Wharton, we went to the Milam Street Coffee House to hear the Davang family of Lauren, Chelsea and Jeff sing. I have known these friends for many years. I had no idea they were so talented. Lauren (Davang) and her sister, Chelsea, both gave several solos with material from country to jazz. It was great! So many times, I have opportunities to go places and just don’t try to get out to do new things. Saturday dawned cold and clear. Kona was outfitted in Kena, the Doberman’s, zebra jacket. 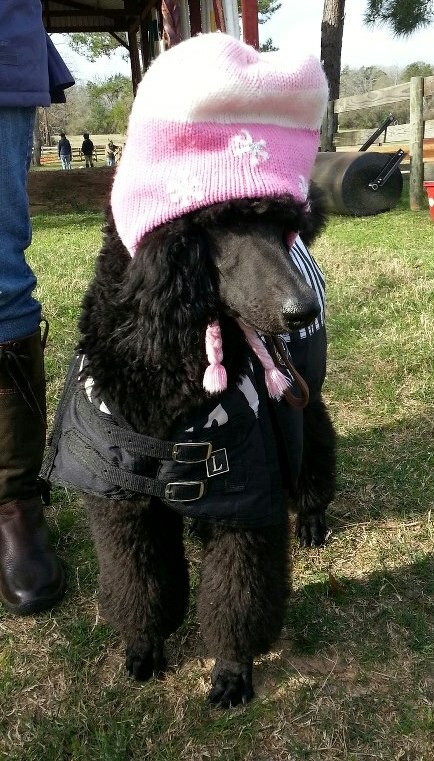 At one point little Abby volunteered her pink hat and Kona was adorable! Kona did very well never creating a problem or barking at other dogs or horses. I think I finally have a horse show dog! He slept in the back seat of the truck quietly there and back (and no throwing up like Kena always does). Lauren and Feather had solid trips over fences. Each time they got a little better and more relaxed. I cannot express the progress they have made from last fall. Their lines are more fluid and jumping is more consistent. We are still chasing a blue ribbon but ended up with two-thirds and two-fourths. I think their flat round was really great. We had a tired mare as we went to load her in the trailer to head home. She did not even think about refusing to load. I think she was thinking instead of her friend Mickey and laying down in her own stall without all those noisy show horses. We learned our pony Mimi was at a barn our friend Holly also trained at. She had seen the other trainers working with Mimi. Holly told us the little pony was doing fine. We haven’t heard a word from the people who are trying her out so it was good to know she is doing well. Jim continues to get better and should be going home from the hospital soon. He has had a lot of company with many members of his family making the trip to Arizona to see him. Of course, for much of the country this week, a trip to Tucson for any reason would be a great idea. 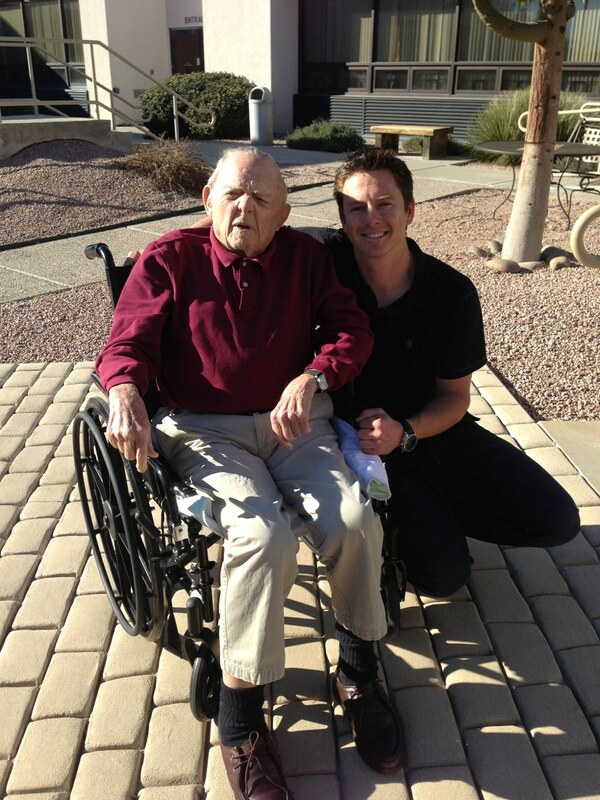 This is Jim with his grandson Tanner Foust whom some of you might know from the TV show “Top Gear”. Yesterday, Lauren and I stripped stalls, hauled out many wheel barrow loads of manure and then brought in a couple hundred of pounds of shavings to re-do each stall. Personally, I need another day off to catch up from my weekend! You will find that standard poodles are happy with whatever makes YOU happy–and they are happiest when they are with YOU ;o) Adorable picture. Kona looks tres chic!! I am loving my Kona!